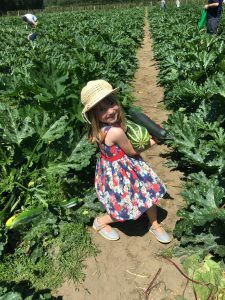 I saw Garsons had been recommended as a great Pick Your Own farm on my daughters’ school’s Facebook page. It sounded like a great activity for a sunny Sunday. 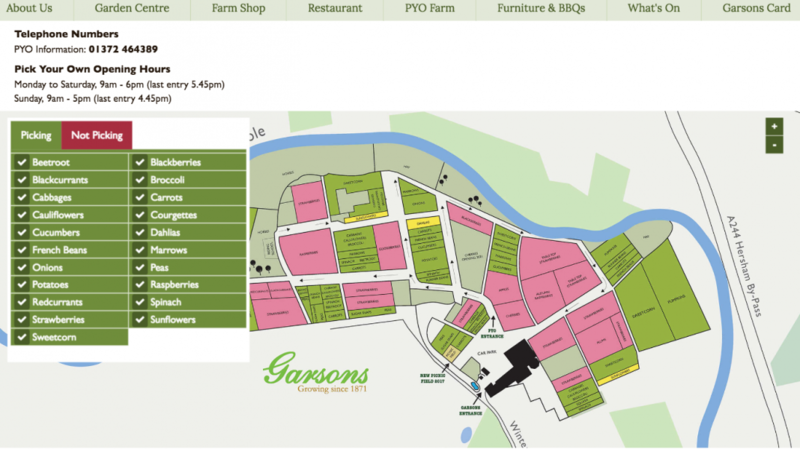 Garsons has two sites: one is Esher in Surrey and the other in Titchfield in Hampshire. Both have an award-winning garden centre and farm shop. However, for the kids it was only going to be about picking their favourite produce. 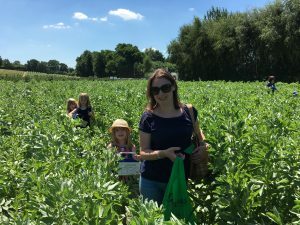 We headed to the Esher one, which is the largest Pick Your Own farm in the UK (more than 30 different crops grown over 150 acres). 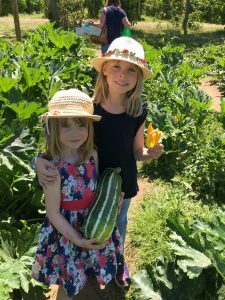 The girls were really excited about the prospect of picking their own and all had specific things that they really wanted. We got a map as it’s pretty extensive so you need to be in the right part. There was loads of parking on the periphery by the garden centre and farm shop, but also by the different crop sections. 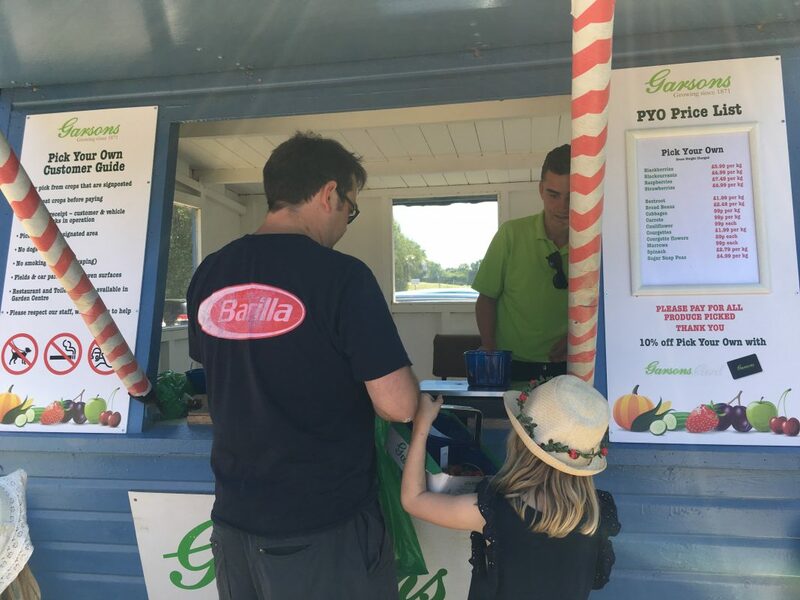 We parked up and collected punnets for the fruit and bags for the veg from one of the many kiosks on the site. 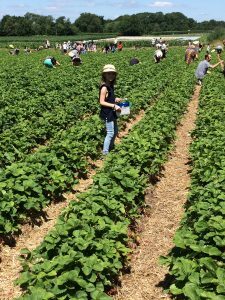 Our visit was in early July so there was an absolute abundance of strawberries and raspberries, which they all wanted. 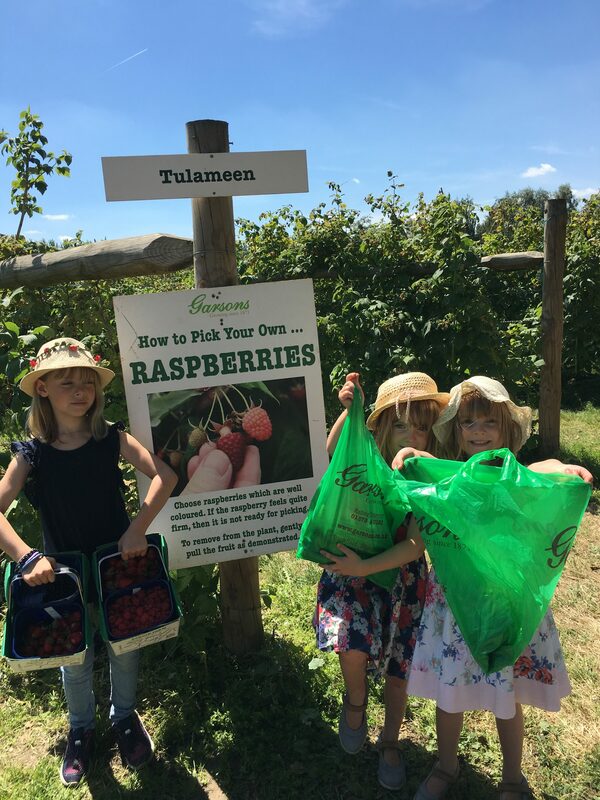 There were information boards, which explained how to know if the raspberries were ripe so with this in mind the girls were let loose. They picked loads! 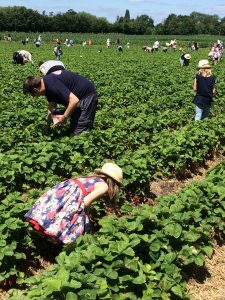 We then moved onto the strawberries and the children quickly learnt which to pick. Again we picked loads. Maria has a particular thing for sugar snaps and was very keen to go and pick some so we headed to that section next, but on the way stocked up on a few blackcurrants. We then moved on to the neighbouring broad beans. We were about to go and pay and then saw some people with courgette flowers. 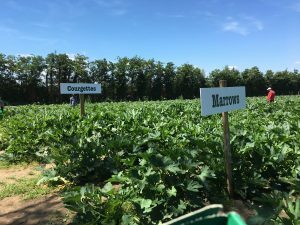 I love ‘fiori fritti’ – literally deep fired courgette flowers – so off we headed to another section. We picked both the courgettes and the flowers and a marrow for good measure. Then we headed to get everything weighed and pay. The girls definitely thought of it as a day out and really had a lot of fun. The produce was great quality and lasted ages. We used some of what we picked that day for dinner. Along with fish and meat we had a broad bean and potato salad and deep fried the courgette flowers as an antipasto; Eton Mess was dessert. Fruit is usually a big hit anyway, but vegetables can be a harder sell. The girls were so much more willing to try veg they picked themselves. We’re looking forward to going back in late summer for a different selection.